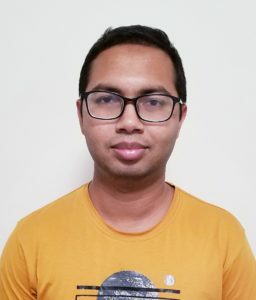 MD Momen Bhuiyan, a Ph.D. student in computer science at the Discovery Analytics Center, is focusing his research on social computing. He is currently working on news consumption issues in relation to social media, trying to solve problems of fake news through computation and design. In November, he presented a poster, “Feed Reflect: A Tool for Nudging Users to Assess News Credibility on Twitter,” at the 2018 ACM Conference on Computer-Supported Cooperative Work and Social Computing in New York City. Collaborators included his advisor Tanushree Mitra. Bhuiyan holds a bachelor’s degree in computer science from the Bangladesh University of Engineering and Technology. He was attracted to the Department of Computer Science at Virginia Tech because of its diverse faculty and great reputation in Human Computer Interaction (HCI). As an undergraduate, he was primarily interested in the application of computing tools and most of his exposure was to data mining and natural language processing. “My undergraduate experience helped me build a repertoire for their applications in graduate school,” he said. Bhuiyan, on track to graduate in Spring of 2020, said he would like to apply his skills in an industry position where he could make a meaningful contribution.